These personas identify players as a certain type of gamer with a set of motivators, behavioral tendencies, and action triggers. Gaming personas match up against potential game mechanics that are designed to encourage each user type to take desired actions, complete goals, and interact with other players. 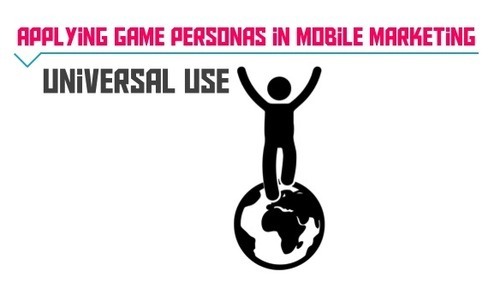 We have identified three key benefits to marketers for applying gaming-inspired personas to mobile experiences. Let’s take a closer look at the first benefit in our series: Universal Use. The techniques used for creating gaming personas have an interesting side effect: they all but eliminate the traditional use of demographics to create personas, which rely heavily on age bands, gender, and geography. Sounds crazy, right? These demographics are the paradigm under which basically all marketing has been rooted for the past 50 years. With gaming personas, an 18-year-old male in Hollywood, CA, can have the same persona as a 45-year-old female executive in Atlanta, GA. Behaviors can span typical socio-demographic bands. When the goal is engagement and conversion, behavior is the objective, so why shouldn’t the targeting approach take root in the drivers behind that motivation which creates interaction. This behavior approach is especially valuable given the limited availability of real-time demographic data in the mobile space. Stay tuned to the blog or follow Dragon Army on Facebook and Twitter to stay updated as we continue our series on applying gaming personas to mobile marketing.